About this edition: This edition contains a teaser of the first chapter of the next edition (The Tunnel Mystery by J. C. Lenehan). About the author: James Corbett (1887-1958): Be careful - there are least three authors named James Corbett. This is not the one who wrote about hunting in Africa, or the history of football. sf-encylopia.com states Corbett is the "author of popular thrillers for the lending-library market ... his identity has not been clearly established." This James Corbett is the subject of the article Thriller Author James Corbett’s Mystery Writing Genius by William F. Deeck; which provides a list of many of Corbett's amazing sentences. George Merrivale, an invalid confined to his room - or is he? Synopsis: First off, this book has nothing to do with Sir Henry Merrivale, a fictional detective created by "Carter Dickson", a pen name of John Dickson Carr. 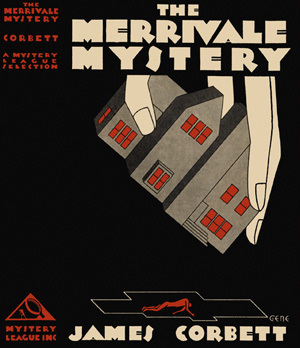 Detective Victor Serge is called in to investigate the death of Sir Philip Merrivale, found shot to death in Merrivale Hall. He brings along his friend and companion Ralph Moreton. Merrivale Hall is chock full of various relatives, and the word is that they all hate each other. He interviews Lady Sybil Merrivale, now a beautiful young widow; who immediately claims he was shot by his brother, Stephen. Stephen, in turn, accuses Sybil. Stephen himself is likewise shot, even before the body of Philip can be removed. No one wants to discuss why all the Merrivales live together, other than there is a 'secret arrangement' by which those in residence receive lavish monthly allowances; and no one will discuss who really owns Merrivale Hall, or pays for its operation and the allowances. Review: Oh my, this book should be read not as a serious mystery; but if you would enjoy a writer who has fun with the English language this is for you. It is an improbable mystery (and the author repeatedly tells you what a mystery it is throughout) with the dark English manor, a beautiful young widow, eavesdropping servants, hidden passages, and so on; with the obligatory love story running through it as well. Be sure to read the linked article above for a taste of his writing. Words are used in completely new ways, with several exclamation points per paragraph, and off-topic sentences thrown in at random. "Curse the whole press of the kingdom, Dawson. The sooner you and I start growing oranges in Spain the better!" and "I was tired to death hearing them call me insane. I took two arsenic pills (do they really make arsenic pills?) which I keep in case of emergency..."
As for the mystery of the three murders (which all occur at the very same spot - #2 occurs before the body of #1 can be removed), it is revealed at the end, but several rules of fair play with the reader are tossed out the window. Don't read it for the exercise of matching wits with the detective. Just read it and hold on tight!